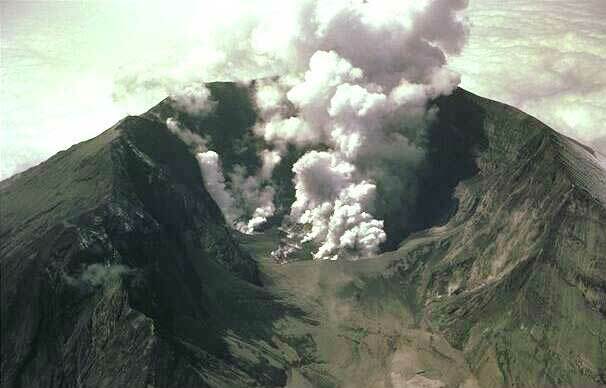 Mount Tambora stands on the island of Sumbawa, south of Borneo. It is one of 150 active volcanoes that dot the 17,508 islands of Indonesia. In early April of 1815, Tambora kicked into gear, spewing dark clouds, jets of fire and lava. After a week of heavy activity, Tambora detonated with a force estimated at four times that of the famous explosion of 1883 at Krakatoa. 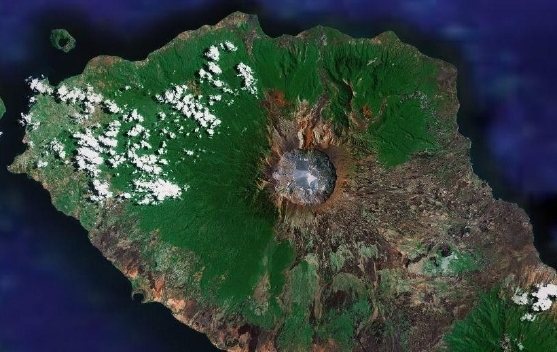 It is the most violent volcanic eruption ever recorded in human history. Roughly half of the mountains’ height of 4300 meters (14,000 feet) was pulverized and shot as hot ash 45 km (150,000 feet) straight up into the stratosphere where it began its slow slide around the planet. Some 10 to 12,000 people died as a direct result of the explosion, the choking rain of ash and fire, and tsunamis it provoked. By the time its effects dissipated, some 5 years later, Tambora had killed an estimated 70,000 worldwide through extreme weather, famine and disease. The sheer volume of ash from Tambora, along with that of lesser explosions that year at La Soufrière in the Caribbean and Mayon in the Philippines produced a volcanic winter, perverting the global climate. Beyond the immediate and catastrophic effects across Indonesia, the sulfurous shadow of Tambora reached around the globe. Through summer and fall of 1815, England experienced brilliant red sunsets. In Italy, pumice floated on rivers and red snow fell. The snow was a muddy brown in Hungary. In 1816, the Northern hemisphere would experience its coldest summer on record. The northeast United States was enveloped in a dry fog that neither rain nor wind could disperse. Through the veil, sunspots could be observed with the naked eye. Frost destroyed crops in New England and river ice appeared as far inland as Philadelphia. Up in Quebec City, a foot of snow fell in June. Crops failed ‘round the world, spreading famine in China, then on to Ireland. Food was rare and prices rose across Europe, provoking riots in Britain, France and Germany. Rainfall that year was twice the annual average. That summer, in 1816, in Switzerland, on Lake Leman, just outside Geneva, Lord Byron’s guests arrived at Villa Diodati. The vacationing party included Percy Bysshe Shelley, Mary Godwin (she and Percy would wed in December), Claire Claremont and John Polidori. Trapped indoors, the party entertained themselves reading ghost stories. You know the rest. Frankenstein was seeded in the heart of a volcano. Wrapped in dark clouds and catastrophe, it raced clear around the world to meet its mistress, signaling its presence in the electric scrawl of unnatural lightning. Today, through Mary Shelley’s Frankenstein, the explosion of Mount Tambora is still being felt. On Wikipedia, read about Mount Tambora and The Year Without a Summer. A fascinating discovery: The Lost Kingdom of Tambora. I like the connections you make between the destructive power of the volcanic eruption and the creation of Shelley's Monster. Fascinating to think that Dawley's 1910 version of Frankenstein envisions the Monster created from ashes in a furnace of smoke and fire--almost a volcanic type of creation. "Today, through Mary Shelley’s Frankenstein, the explosion of Mount Tambora is still being felt." Tambora is not lies in south borneo, it's lies in Sumbawa island, part of nusa tenggara barat province.